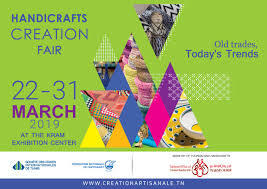 Tunisian activists of the country’s 2011 revolution have lambasted the 36th handicrafts creation fair held in capital Tunis over the presence of books containing speeches of ousted leader Zine El Abidine Ben Ali. Officials from the Handicrafts Office (affiliated to the Ministry of Tourism) distributed “Traditions & Artistic Crafts from Tunisia”, a book containing quotes of Ben Ali who was deposed in 2011 and had since then been living in Saudi Arabia, Middle East Monitor (MEMO) reports. He is wanted by Tunisian justice for several charges. The book caused controversy with activists criticizing the fair organizers on social media over what they branded a “conspiracy by the regime” against the revolution, MEMO adds. Posted by Emmanuel Agbenonwossi on March 25, 2019. Filed under News, Zoom. You can follow any responses to this entry through the RSS 2.0. Both comments and pings are currently closed.